The manipulation or distortion of truth should be opposed wherever it crops up, no matter what the source. For, as it says in a verse of Psalm 62 traditionally recited at Sunday Lauds: “The king shall rejoice in God; all who swear by him shall glory; for the mouths of liars will be stopped” — a verse that was, incidentally, expunged from Paul VI’s Liturgy of the Hours. Anyone who has taken any trouble at all to study the history of the Second Vatican Council knows that it was an exceedingly complex event, with many currents of thoughts, extremely sharp disagreements among individuals and factions, and crafty manipulators behind the scenes, as one learns from eyewitnesses (e.g., Wiltgen, Lefebvre, Congar, de Lubac) and historians (e.g., De Mattei). It was no simple triumphal march of progressivism over the graves of obscurantists, as much as the victors wish they could rewrite the narrative by conveniently glossing over or dismissing the actual debates in the aula and the final texts of the documents, in which a conservative or traditional viewpoint is often reflected. This is not to say that the documents are unproblematic; fifty years of hermeneutical battles have sufficiently demonstrated the contrary. It is merely to say that the popular narrative of the Council as a “new Pentecost” driven forward by a nearly unanimous groundswell of support for innovation and modernization is far indeed from the variegated and uneasy truth of things. The documents were compromises, no doubt about it; the liberals did plan to leave them behind as soon as possible, like lower stages of a Saturn V aiming for the moon; the traditional elements in the documents are, by now, almost completely buried and forgotten; the Church is plentifully reaping the destructive results of rupture and discontinuity. All this is true. But it still gives us no carte blanche for rewriting the Council itself, unless we wish to be among those whose mouths will be stopped. At the same time, especially given the various clearly expressed views of the Council Fathers with regard to the use of the vernacular language in the liturgy, the Church was aware of the difficulties that might present themselves in this regard. The goal of the translation of liturgical texts and of biblical texts for the Liturgy of the Word is to announce the word of salvation to the faithful in obedience to the faith and to express the prayer of the Church to the Lord. For this purpose it is necessary to communicate to a given people using its own language all that the Church intended to communicate to other people through the Latin language. 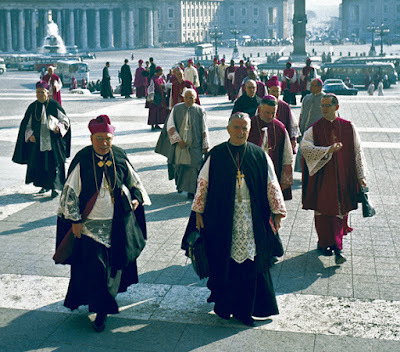 How curiously unlike what one discovers poring through the great big volumes that contain the speeches of the Council Fathers — all those religious superiors, bishops, archbishops, and cardinals who spoke day after day in the opening session in 1962! When reading their speeches on the liturgy schema, one is struck by how often they return to the subject of Latin. Even after repeated requests by the moderators to stop talking about it, the subject kept popping up. Almost every speaker had an opinion and wanted to share it (each making his remarks, of course, in Latin—for the Council was the last great event at which one could sense vividly the glorious unity of a global, multi-racial Church communicating in a common mother tongue that belonged to no imperial power; this we lost as a punishment for the new tower of Babel we attempted to construct in the 1960s). Yes, it is true that a number of Council Fathers spoke out strongly in favor of greatly increasing the role of the vernacular; but they were a minority. There were many more who admitted that its use should be expanded in certain situations, while not displacing the customary Latin; and there were many besides who adamantly reaffirmed the primacy of Latin due to qualities frequently acknowledged by the Magisterium of the Church, such as its antiquity, longevity, stability, and universality. One of the experts sitting at the Council, soaking it all in, plotting his way through the maze of opinions and endless evening gatherings, was the Jesuit theologian Henri de Lubac. He was later to acquire a reputation for conservatism, but that was only against the backdrop of the insanity that would follow. When the Council opened, he was widely seen as a progressive, even a modernist, for his laudatory book on the pseudo-mystic Teilhard de Chardin. De Lubac has left us a precious historical document, the Vatican Council Notebooks, in which he wrote down detailed notes about his experiences each day at and around the Council. The very fact that de Lubac’s progressivism inclined him to pay less attention to the boring conservatives and more attention to the exciting young Turks makes it all the more striking that he records so many (but not all of the) conciliar speeches in favor of Latin. In other words, since we know he is not attempting to push a pro-Latin agenda—if anything, the contrary is true—his testimony reliably indicates the depth of thought and sentiment on behalf of Latin among the Council Fathers. 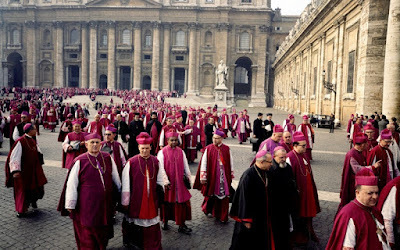 As we shall see, too, many of the Council Fathers vividly anticipated the curse of too much liturgical variety and diversity of adaptation, and pleaded in favor of liturgical unity against decentralization and the fragmentation of decisions. Their warnings went unheeded. 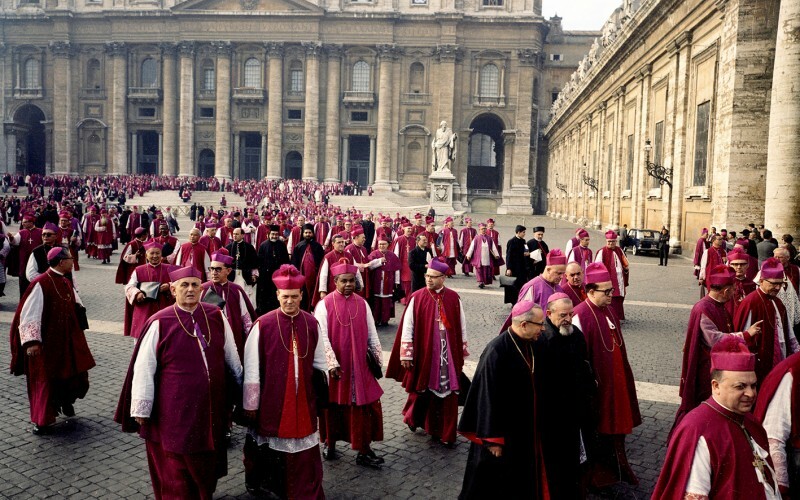 What we see in de Lubac’s summaries of these interventions is just how lively was the desire of many Council Fathers to see Latin remain unimpaired in its majestic role as a source and symbol of Catholic unity and as the traditional vesture in which the sacred rites were clothed, so that they could remain the common possession of Holy Mother Church instead of the sport and prey of various national episcopacies and their linguistic and cultural agendas. As hackneyed as the saying may be, perhaps we may be excused for invoking it: The more things change, the more they stay the same. The hopes and fears of the Council Fathers speak with exactitude to our current situation. Their repeated protests against the supposed magnum principium and its corollary of decentralization remain a matter of historical record that no one can alter. It occurs to me that, given the trend of the above quotations, it would be helpful to include in this article the sections of the definitive text of Sacrosanctum Concilium that correspond to the points discussed by the Council Fathers above. It will be immediately obvious that the perspective of the pro-Latin Fathers was enshrined in the text (as even Bugnini admitted), while not, of course, excluding some introduction of the vernacular, a point on which almost no one disagreed. We might say, in retrospect, that some of the following language was meant to placate the conservatives while paving the way for a revolutionary agenda, but whatever the case may be, the pro-Latin Fathers did vote in favor of the final version of the text, evidently believing their concerns to have been adequately reflected therein. 36. §1. Particular law remaining in force, the use of the Latin language is to be preserved in the Latin rites. §2. But since the use of the mother tongue, whether in the Mass, the administration of the sacraments, or other parts of the liturgy, frequently may be of great advantage to the people, the limits of its employment may be extended. This will apply in the first place to the readings and directives, and to some of the prayers and chants, according to the regulations on this matter to be laid down separately in subsequent chapters. §3. These norms being observed, it is for the competent territorial ecclesiastical authority mentioned in Art. 22, §2, to decide whether, and to what extent, the vernacular language is to be used; their decrees are to be approved, that is, confirmed, by the Apostolic See. And, whenever it seems to be called for, this authority is to consult with bishops of neighboring regions which have the same language. §4. Translations from the Latin text into the mother tongue intended for use in the liturgy must be approved by the competent territorial ecclesiastical authority mentioned above. 54. In Masses which are celebrated with the people, a suitable place may be allotted to their mother tongue. This is to apply in the first place to the readings and “the common prayer,” but also, as local conditions may warrant, to those parts which pertain to the people, according to the norm laid down in Art. 36 of this Constitution. Nevertheless steps should be taken so that the faithful may also be able to say or to sing together in Latin those parts of the Ordinary of the Mass which pertain to them. And wherever a more extended use of the mother tongue within the Mass appears desirable, the regulation laid down in Art. 40 of this Constitution is to be observed. b) In harmony with the new edition of the Roman Ritual, particular rituals shall be prepared without delay by the competent territorial ecclesiastical authority mentioned in Art. 22, §2, of this Constitution. These rituals, which are to be adapted, also as regards the language employed, to the needs of the different regions, are to be reviewed by the Apostolic See and then introduced into the regions for which they have been prepared. But in drawing up these rituals or particular collections of rites, the instructions prefixed to the individual rites the Roman Ritual, whether they be pastoral and rubrical or whether they have special social import, shall not be omitted. 101. §1. In accordance with the centuries-old tradition of the Latin rite, the Latin language is to be retained by clerics in the divine office. But in individual cases the ordinary has the power of granting the use of a vernacular translation to those clerics for whom the use of Latin constitutes a grave obstacle to their praying the office properly. The vernacular version, however, must be one that is drawn up according to the provision of Art. 36. As regards the language to be used, the provisions of Art. 36 are to be observed; for the Mass, Art. 54; for the sacraments, Art. 63; for the divine office, Art. 101. 116. The Church acknowledges Gregorian chant as specially suited to the Roman liturgy: therefore, other things being equal, it should be given chief place in liturgical services. But other kinds of sacred music, especially polyphony, are by no means excluded from liturgical celebrations [by chant’s chief place], so long as they accord with the spirit of the liturgical action, as laid down in Art. 30. I take it as a given that Gregorian chant here means what everyone understood it to mean in 1963, namely, Latin plainchant. Moreover, if the treasury of sacred music is to be preserved, this must be referring to the great body of Latin music already in existence prior to 1963; the fostering would include new compositions in Latin and the vernacular.